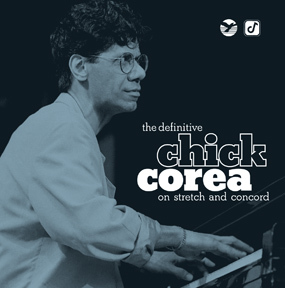 Pianist/keyboardist Chick Corea, a 60’s sideman of such jazz luminaries as Blue Mitchell, Stan Getz, and Miles Davis, and one of the first musicians to marry a jazz sensibility to rock rhythms and electric instruments during the early 70’s with his jazz-rock group Return to Forever, has never been satisfied to rest on his musical laurels. In fact, the virtuosic and restlessly creative musician — at times affectionately referred to as “The Chameleon” for his ever-changing musical interests — has immersed himself into virtually every conceivable musical genre, from jazz to Latin to pop to classical and back again. From solo piano, to duos, trios, quartets, big bands, and even symphony orchestras, the man has truly done it all. The 15-time Grammy winner is arguably our greatest living jazz musical treasure. This amazingly diverse 2-CD collection, spanning the three decades from 1979-2009, draws musical slices from 18 separate recordings and is more or less evenly split between live and studio material. A few of the many highlights: “Tap Step,” from the album of the same name, opens the collection with an irresistible musical romp with driving solos from all, including the late, great saxophonist Joe Farrell. “Crystal Silence,” originally penned and recorded in 1972 and gorgeously recreated here live with the Sydney Symphony Orchestra in Australia 35 years later, demonstrates the seemingly telepathic musical interplay between Chick and his long-time vibraphonist Gary Burton. For even more exotic fare, “North Africa,” from the stellar double Grammy-winning recording, “The Ultimate Adventure,” is a meld of African and flamenco rhythms, complete with Jorge Pardo’s ever-soaring flute, the hypnotic rhythmic percussion triad of Airto Moreira, Vinnie Colaiuta, and Rubem Dantas, and Corea’s fine solo underpinnings on Fender Rhodes clavinet. On acoustic piano, Chick simply sparkles on his best-known, signature tune, “Spain,” performed live before an enthusiastic audience. For the Beatles’s “Fool on the Hill,” young Japanese pianist Hiromi joins Chick for some spirited duet hijinks. The collection concludes with another Corea classic, “La Fiesta,” a previously unreleased live version recorded in 2009 with two of his former Return to Forever compadres, Stanley Clarke and Lenny White. Collectors looking here for other unreleased material will be disappointed, but for those unfamiliar with Corea’s musical genius, this collection is the best introductory launch platform yet released for exploring the many varied facets of the man and his music. Very, very highly recommended. Chick Corea: Documentary of Legendary Jazz Great, Pianist and Composer from Chick Corea on Vimeo.